Going on a off-road vacation in the wilds of the Australian jungle is a tremendous challenge, if you are a newbie in the branch. Itchy skin, restless sleep, creepy noises and mosquitoes buzzing around like a Tiltrotor helicopter are no match for a 1st-time camper. Managing to survive trough the whole trip is an art of combining quirky tricks and complex skills. Still, with the proper tools in hand, adapting to your otherwise unfriendly habitat can be easy as a breeze. The number one of my bucket list this year is buying that cool "Stingray" portable tree house I spotted on Gear Junkie. It sure is a glamorous idea having in mind all the nasty bugs crawling around the tent at night. Featuring an unusual way of camping, the tripod string tent is a wonderful solutions for all the outdoorsy explorers who are not afraid if heights. Stretch and attach you tiny forest dwelling on the nearby trees and climb up the ladder to find a relaxing bedding solution which skips the bumps of the common tent sets. What VSSL ( pronounced Vessel ) made for camp devotees goes beyond cool. It is a must-have for any trip buff who likes to tackle upon crazy outdoor adventures. Equipped with even one of the survival tools offered in the back will guarantee you a care-free vacation knowing you have just what you need to handle any wacky situation you might get it. Choose among an abundance of gear such as the "Shelter", "Supply" or "First Aid" and scare the creepers out with the awesome "Zombie" pack. Wanna go on a family trip, but care to share a bed only with your loved one? No worries! Fresh out on Amazon, you can find the mammoth sleeping bag and forget about all your troubles. Quite well-described with its name, the Mammoth camp bed has room big enough to squeeze in your wife, the kids and even the dog. 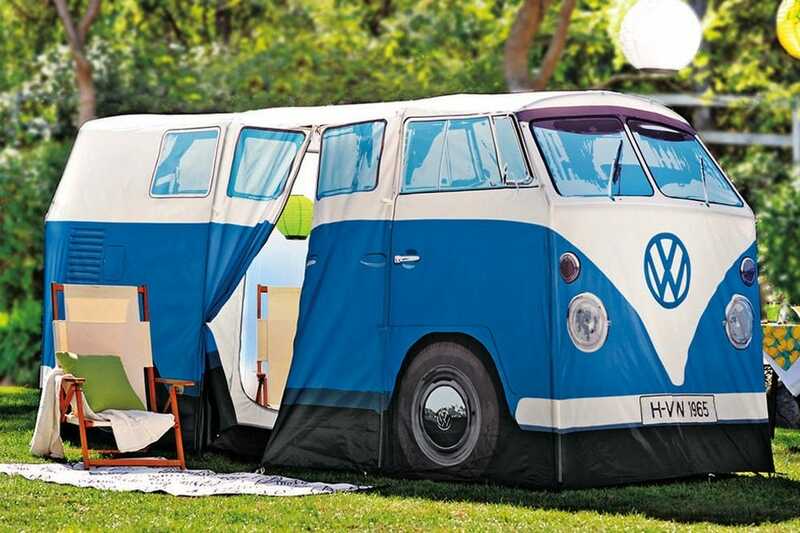 Pair up with the Full-Sized Volkswagen Tent to get the perfect feeling of family camping. Dying to do something crazy on a trip, but you've role-played a zombie apocalypse with your buddies almost a thousand times? 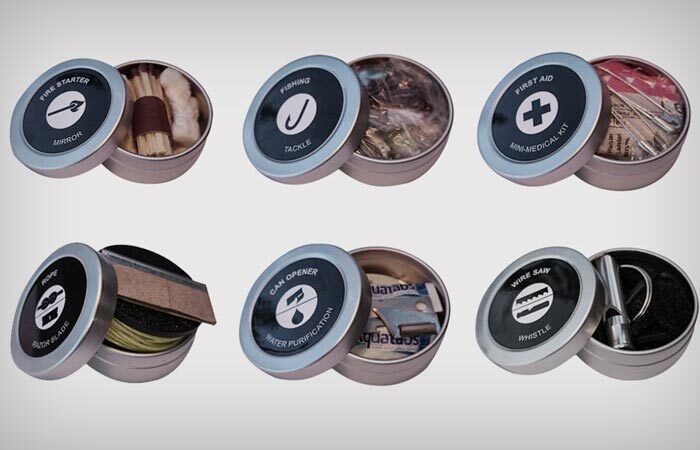 We've got you covered with a cheap and quirky solution to your camping party problems. Go for Breaking Bad and use your chem skills to colour up your fireplace. The Campfire Dude has shared a full page of campfire recolouring recipes to amaze even the most conservative minds. And in case Walter White isn't your alter ego, you can always buy a colour pack from Amazon or any other camping-focused store. We all know camping is a lot about having a tasty bite with friends near the campfire. We already got it coloured like a disco ball. The only step we need to take is cook the food. Except if you are not a raw food enthusiast, you would probably like to prepare some food and the aluminium nesting cookware might be just what you need. With this cool camping hear in hand, you might just want to move in the forest, just like this Virginian couple did. And if handling the messiness of the outdoor life just isn't for you can always call in a vacate cleaning crew to spruce up your home while you are away and at least get back to real-life without having to deal with right away with the house chores. 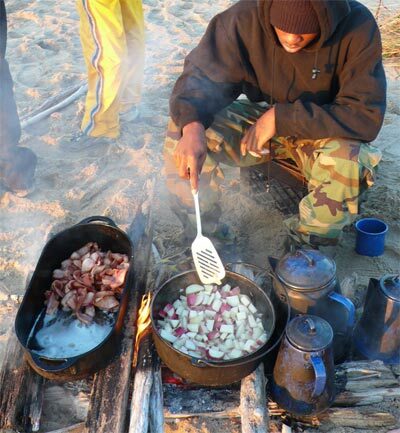 Don't forget to give us a thumbs up, if you liked this list and have an awesome camping!